Last Shabbat – last Saturday – I “escaped” from the media coverage of what was happening in Israel and Gaza and the horrifying news of the downed Malaysian airplane to the serenity and peacefulness of the Reform Movement’s Camp Eisner in Great Barrington, MA. If only the rest of the world could experience the sense of tranquility, wholeness and community that exists at one of our Reform Movement camps! We began our morning together with a beautiful outdoor Shabbat morning service. What caught my attention most this Shabbat was the interaction between the parents who were visiting for the day and their children who were spending an extended time up at camp either as campers or staff. I observed how parents and their children sat really close together during the service because they wanted to be close together. Some parents rubbed their children’s backs during the service, some children had their arms around their parents. Some siblings sat on their older siblings laps. It was truly a time of family togetherness. I was incredibly moved when one father took his tallit (his prayer shawl), draped it over his daughter and drew her in close. They prayed wrapped in the safety of their father-daughter “cocoon” connected both physically and spiritually. It was their own safe-haven from the rest of the outside world for a short while. A tallit literally represents the 613 mitzvot commandments in the Torah. On each of its four corners is a set of fringes. Each set of fringes is comprised of a specific number of threads, tied with a specific number of knots and one thread is wrapped around all of the others a specific number of times. If you add together all of the threads, the knots and the wrappings from all four corners, they add up to 613. By putting on a tallit, we are symbolically taking upon ourselves the responsibility and obligation of the commandments. There’s another purpose to a tallit, however. It acts as a “cocoon” and separates us from what is taking place around us. Having a tallit wrapped around our shoulders during a time of prayer and meditation can help keep us focused on our connection with God and community. It serves as our refuge from the world outside. The following poem is by the late Israeli poet, Yehuda Amichai. It depicts some of the symbolism, feelings and emotions captured by our memories of the tallit. (embroidered or trimmed in gold). a wedding canopy, a parachute. then opening would-be wings to fly. black and white like a chessboard? Because squares are finite and hopeless. like airport runways where angels land and take off. Whoever has put on a tallis will never forget. still shivering a little, and he laughs and blesses. May we all come to know the peace, safety, serenity and tranquility that comes from being wrapped in the cocoon of a tallit at all times. On Shabbat, we typically light two candles. Why? Because in the Torah the Ten Commandments are repeated twice, the first time in Exodus 20 and the second time in Deuteronomy 5. In each of these, the commandment about Shabbat is slightly different, in Exodus 20:8 we are told to “remember” (zachor) the Sabbath day to keep it holy. In Deuteronomy 5:12, we are told to “observe” (sham or) the Sabbath day to keep it holy. Thus the rabbis of old say we light two candles on Shabbat, one to represent “remember” and one to represent “observe”. The act of “remembering” is passive, while the act of “observing” is active. Shabbat requires that we do both: we remember our history, while we do something physical do make Shabbat our own unique experience. We light candles because the flame is a symbol of God’s divine presence. It is symbolic of the spark of goodness in each of us. 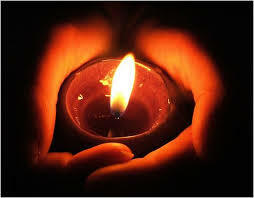 Light one candle in a dark room and the entire room is illuminated by the warmth and glow of that single flame. Shabbat is a taste of that time to come when the world will be filled with the divine sparks within each of us and when each of us can see the divine sparks in the other. No more war, no more violence, no more bloodshed. This week, as we observe Shabbat during this time of violence and unrest in Israel and Gaza, let the light of our Shabbat candles be a beacon of light and hope for all. I share with you a beautiful ritual created by two religious leaders who are mothers and lovers of peace came together this past difficult week to compose a new prayer for peace: The Prayer of the Mothers. Sheikha Ibtisam Mahameed and Rabba Tamar Elad-Appelbaum invite us to take their prayer into our hearts and into the world. Read it below – in Arabic and Hebrew. They also created a new ritual: Inviting us all to light a candle on Fridays – for peace. Another candle for the Sabbath Keeping Jews, a candle for Muslims on their sacred day. See the invocation for this new ritual below. They ask that we help spread this precious new prayer and ritual. May we not light this extra candle for the rest of our lives. But let’s start lighting it tonight. A candle across borders, beyond fear. Until we all arrive at the sanctuary of peace. You who heals the broken hearted, binding up our wounds. Please hear this prayer of mothers. Your name is Life, your name is Peace. For parents holding infants, despair and darkness in their hearts. For a gate that is closing – who will rise to open it before the day is gone? I raise my hands to you in supplication: Please God have mercy on us. Hear our voice that we not despair That we will witness life with each other, That we have mercy one for another, That we share sorrow one with the other, That we hope, together, one for another. For Your sake, our God of Life Let us choose Life. English Translation Amichai Lau-Lavie, The Founding Director of Storahtelling, Inc.
اسم الحياة, اسم السلام في العالم. Is This the Fast I Desire? Posted on July 18, 2014 February 19, 2016 Leave a comment on Is This the Fast I Desire? As we watch the escalation of events unfold in Israel and Gaza this week, we pray for an end to the barrage of missile attacks on Israel, an end to the violence on both sides. We pray for a time of peace and harmony. When neighbours do not hate, do not kill, do not treat each other as “less than”. We pray for a time when Jerusalem can live up to the meaning of its name: City of Peace – Iyr Shalom. The notion of “Jerusalem” is a metaphor. In our tradition, we have a concept of two Jerusalems: Y’rushalayim shel lamala – the heavenly Jerusalem, and Y’rushalayim shel lamata – the earthly Jerusalem. The heavenly Jerusalem is the ideal to which we aspire. The earthly Jerusalem is the daily reality of our lives as they exist now. Thus “Jerusalem” is more of a concept rather than simply a city – it represents a time when all the inhabitants of Israel will live together in peace, when justice will prevail and all will be in harmony. “Jerusalem” is our ideal version of what life should be. “Our feet our standing within your gates, O Jerusalem. The built-up Jerusalem is like a city that was joined together within itself. Request the welfare of Jerusalem; may those who love you enjoy tranquility. May there peace in your walls, tranquility in your palaces. For the sake of my brothers and my companions, I shall now speak of peace in you. May the peace of Shabbat bring peace to all: in Jerusalem, Israel and all the world. Amen. Yesterday, we were shocked and grief-stricken to learn that they had been killed within a short time of their kidnapping. What kind of world do we live in when innocent teens become pawns in terrorist warfare? When the lives of young students have no value? There are always those who want to cause harm and destruction to the Jewish people. There are always those who will go out of their way to wreak havoc and cause us great pain and anguish. But ultimately God’s blessing will be with us, because we value LIFE above all else. We are a religion that celebrates and affirms life no matter what life sends our way. And because of this, the Jewish people has survived and thrived. We are a people of great fortitude and stamina. With God by our side, we can persevere. I join with people in Israel and all over the world in mourning the tragic deaths of Eyal Yifrach, Naftali Frenkel and Gilad Shaar. May their families find comfort and strength in the loving embrace of community and family and friends. May we come to know a time of peace when children can walk in the streets freely – without fear, without bloodshed, without violence. As we mourn these unfinished lives, let us pray that that cycle of violence ends. Let us pray for a time of peace for all of God’s children. Od yavoh shalom aleinu, v’al kulam – let peace come upon us and upon everyone. Speedily and in our time. Amen.